After finishing The Man on the Balcony, I decided to go back for more of Martin Beck and his colleagues, and I'm so happy I did. 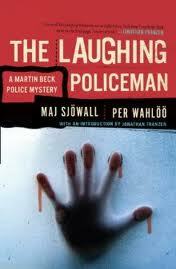 The Laughing Policeman is the fourth in the Martin Beck series, and so far it is my favorite from this writing duo. While the police in Stockholm are busy at the American Embassy where a protest against the Vietnam War has turned very ugly, patrolmen Kvant and Kristiansson, the Keystone Cop-ish police officers who just so happened to have inadvertently solved the case in The Man on the Balcony, are just biding their time until their shift is over. Crossing from the municipality of Solna into Stockholm, they're flagged down by a man walking a dog who reports an accident. The two drive on over and discover a doubledecker bus with lights on and doors open off the road. Inside the bus are several dead bodies, all gunned down in their seats, and the scene looks like a massacre. The homicide squad headed by Martin Beck arrives and discovers that one of their own is dead on the bus -- a young police inspector named Ake Stenstrom. There are very little clues on the scene, thanks to Kvant and Kristiansson, and as far as motive, until Beck and his men can go through the list of victims, it is not readily apparent. To bring the gunman to justice and close the case Beck and his team will have to put in long hours and examine the lives of all of the dead. To discover why this happened, the most important fact they need to discern is the identity of the intended target, not a simple task in the least. Sjöwall and Perlöö's plotting and storyline are not the only reasons this book and the series work so well. The authors also continue to develop their characters' personalities so that the people in the Stockholm homicide squad become more and more familiar to the reader as time progresses. Those two factors, along with their ability to evoke what they consider the social ills and the events of the time period make these short novels so compelling. In the space of only 211 pages the authors manage to set up the plot, detail the often-frustrating investigation, catch up on what's going on with Beck, Kollberg and the other main players, and wrap things up in a more than satisfying conclusion. 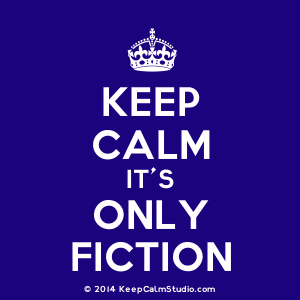 They keep the superfluous prose away, giving the reader only what's needed to keep the story going. There are no torrid love affairs, no in-depth soul searching or major subplots to sidetrack the reader -- Sjöwall and Perlöö are probably among the best crime writers in terms of their focus on the crime at hand, while still managing to continue the growth of their beloved characters. The time frame is well established through their use of current events like the Vietnam War protests and American serial killers of the time (especially Charles Whitman and the U of Texas shootings). They also have this ability to make the reader laugh in the midst of terrible crimes; here they go on about psychologists and profiling of serial killers in a discussion that was priceless. I'd definitely recommend this book and the entire series to anyone who wants to read something intelligent in the realm of crime fiction, and to readers of Scandinavian crime fiction in particular. You can't read just the current popular authors and feel like you have experienced the best that the Nordic countries have to offer -- this series is a no miss, for sure. ...whose idea was it to make a movie of this book and set it in San Francisco???? According to author Jo Nesbø, who wrote the introduction to this edition of the novel (third in the Martin Beck series), Man on the Balcony found its inspiration in an actual case that occurred in Stockholm in 1963. At that time, two little girls were sexually abused and then murdered by someone who lured them away from the park where they were playing. Man on the Balcony imagines a similar case and its authors deliver it into the hands of Martin Beck and other detectives of the Stockholm police. As the story opens, a man is sitting on his balcony as the sun comes up one June day. There he smokes cigarettes, drinks coffee, and watches. He looks at the roofs of other buildings and observes the street below him, and as the city begins to awaken, he watches traffic, pedestrians, cyclists, and a man walking his dog -- nothing out of the ordinary really. The action then switches to the police station, where Martin Beck and his colleagues are discussing the latest in a series of serious muggings that have been taking place in the city parks. But the worst is yet to come -- in one of these parks, two "seedy figures" looking for coins in the grass take a break, open a bottle to share, and come upon the body of a young girl hidden beneath a bush. It is only the first of what will become a series of murders, and Beck (who is always referred to as "Martin Beck" throughout the novel) and the other detectives now find themselves in a race against time before the killer strikes again. thought too of the swift gangsterization of this society, which in the last resort must be a product of himself and of the other people who lived in it and had a share in its creation. He thought of the rapid technical expansion that the police force had undergone merely during the last year; despite this, crime always seemed to be one step ahead. He thought of the new investigation methods and the computers, which could mean that this particular criminal might be caught within a few hours, and also what little consolation these excellent technical inventions had to offer the women he had just left, for example. Or himself. Or the set-faced men who had now gathred around the little body in the bushes between the rocks and the red piling. Sjowall and Wahloo also draw attention to the social climate of the times in Stockholm and Sweden, reflecting not just on what occurs within police precinct walls but throughout the city as well. At the park at Mariatorget, for example, a place where "schoolchildren and other young people met the small-scale dope pushers,"
Every day large quantities of hashish, marijuana, preludin and LSD were passed furtively from seller to buyer. And the buyers were getting younger and younger. Soon they would become addicts... Drug-taking among young people was caused by a catastrophic philosophy which had been provoked by the prevailing system. Consequently society should be duty bound to produce an effective counterargument. For many readers, the commentary on Sweden of the late 60s might not be a drawing point, but it adds a sense of the realism regarding the society in which these fictional crimes occur. This is a hallmark of the other books in the series as well, in which the authors "use the crime novel as a scalpel cutting open the belly of the ideological pauperized and morally debatable so-called welfare state of the bourgeois type." But going beyond the social criticism, Man On the Balcony is a realistic novel where the characters behave in a realistic fashion. Take the main character, Martin Beck, for example. Now a superintendent, he still suffers from insomnia, still has problems with his wife and still has trouble making sense of society, but is not nearly as angst ridden as some of the more modern Scandinavian detectives. He doesn't always agree with his colleagues about the way they're handling either of the cases, but he cares about them and he loves his work. He also knows how to work the system when he needs to. There is a wonderful section in this novel where Beck interviews a three year-old witness that actually made me laugh, but it could only have been Beck that pulled it off. Man on the Balcony is such a good novel that the time spent reading it just flies by. There's an incredible sense of sophistication in the writing, the sense of place and time is very well established, and it's an intelligent read. The length of the book might be short, but it doesn't need to be any longer -- everything that's needed to make this novel work is already there, especially in the characterizations. I can definitely recommend it to readers of Scandinavian crime fiction, to readers who may have read one or two other books in the Martin Beck series and aren't sure about the rest, and to readers of crime fiction in general. If you start feeling sorry so early on, Bora, you're screwed. What should you care? We have our orders and the SD have theirs. It was only an accident that you didn't have similar orders. And these Polack farmers -- they aren't even people, they're not even worth reproducing. I can see you're perturbed, but believe me, don't start caring...We're all in it. If it's guilt, we're all guilty. This is the way that it is. Scenes change quickly in this novel, and the action is offered up from different perspectives throughout the story. The investigation into the death of the Abbess lasts from beginning to end, while other mysteries crop up in the meantime adding to the crime elements of the novel. At the same time, it's a solid piece of historical fiction, examining the psyche of a man who finds himself in a situation where normal laws don't apply and the world seems to have gone crazy. There are, believe it or not, bits and pieces of humor in spots, but overall, given the circumstances, there's little to smile about during this time. Pastor's novel is no lightweight thriller; she's written a much edgier story of a dark time in history. Definitely recommended. 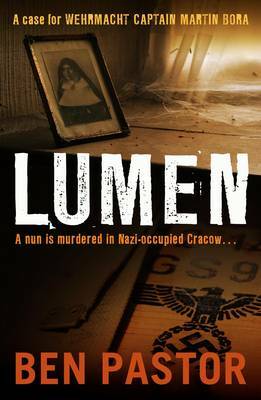 Lumen is supposed to be the first in a series of books about Martin Bora, so I'll look forward to the second. It's also another fine addition to my growing collection of books from Bitter Lemon Press. Maria Vos is a young woman with a lot on her plate. She's a vocalist in a cover band that plays parties, clubs, whatever gigs the group can get. She's a mother of two small children, the oldest only eight years old. She's just left her son's father Geert after realizing that his depression is another weight she can't bear to carry. What she wants is to be a professional singer, but with so much going on, it's probably unlikely to happen. So when she finds herself pregnant for a third time, it is just too much. After some soul searching, she decides to have an abortion, as raising another baby would just be too much. But not long after the procedure, Maria finds herself the victim of some sick notes & pictures left in her mail. She is persuaded to go to the police, but the police can't do anything unless something happens to her -- it seems that threatening letters aren't enough to warrant any kind of official action. But it isn't long until a very cruel joke is played on her, and her nerves just can't take much more. To try and get some peace, Maria takes her two children "back to the coast" to stay for a while at her old childhood home. Her persecutor, however, doesn't care where she is. As the story progresses, a number of possible suspects emerge, all of them with strong motives. Each character is drawn well; each has his or her own individual voice. Characterizations seem to be this author's strong point, and she focuses a great deal on Maria's relationships both in terms of men and her own family. She expertly and believably paints Maria as a mom torn between her own career and her responsibilities to her children, and her problems are easily understandble, making her a sympathetic character. Another positive point of this novel is that the tension in the story starts early and continues throughout. There's also a well-established sense of place, both in Amsterdam where Maria lives and the seaside. The down side of the story is that I figured out the plot and the who very early on. I know this sounds odd, but I very much enjoy being surprised as to the culprit's identity, so if the plot becomes so obvious that I can figure out the solution long before the end, I tend not to read that author's works again. But in this case, the writing was quite good and I was rewarded at the end with more of the "why" than I expected. Another plus: the story's denouement also led to questions about other events throughout the novel, so I found myself going back into the book and having a few "aha" moments as things became a bit clearer. Overall, Back to the Coast is a solid read, offering great characterizations, a good story, good writing and a level of tension that doesn't quite ease up throughout. Despite the fact that the solution is a bit obvious, I'd definitely read another novel by this author. 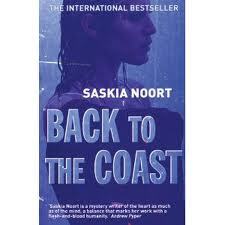 I'd recommend Back to the Coast to readers of translated crime fiction, and to people who enjoy a bit of tension as they read.